Sunningdale’s Old Course was designed by Willie Park Junior and opened in 1901. It was laid out in the last days of the gutty ball, over a mixture of hills, heath and woodland that had hitherto not been considered as suitable for golf course construction. Urns containing fourteen iron-age Skeletons were excavated during its construction. The course was considered extremely long and its popularity owed much to the development of the Haskell ball, initially imported from the United States. Willie Park’s design was considered revolutionary at the time, and within a few years Harry Colt, the Club Secretary, had modified several holes and drastically altered others. 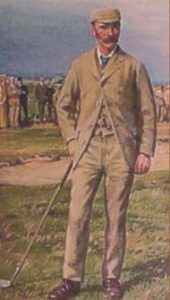 Bernard Darwin in “Golf Courses of the British Isles”, 1910 believed that several of the holes had been greatly improved by the Colt changes. The Old Course is considered one of the best inland courses in the UK and is regularly found in various “100 top courses” rating lists. Many amateur and professional golfing events have been played here including the News of the World Professional Match Play Championship, numerous European Open Championships, many Ladies Open Championships, the Walker Cup, International Final Qualification for the Open Championship, and most recently the Senior Open Championship in 2015. This opening par 5 has been altered recently to encourage the drive to be played to the left of the fairway. The “bumps” in the middle were an iron age burial site. The 2nd tee has been pushed back over the years, and the low handicapper will need to draw his drive. The second shot, holed by Karen Stupples, Ladies Open Champion in 2004 , must be stopped on a green that slopes from front to back. Recent bunker changes have greatly improved what had become an over easy drive and pitch. The ease of the approach is affected by the placement of the drive. A short to mid iron up a hill to an awkwardly sloping green. A Drive from the high ground with bunkers and a pond to avoid. The pond is more of a hazard for the poorly hit second shot. The drive is over heather, followed by a challenging second over more heather with bunkers short and right, to a green which slopes severely from the back. The drive is a blind shot over a large bunker now disused. The major Colt change to the original Park course, altered a dog-leg left second over a now disused bunker to a green now deep in woods, up to its present site much higher and on the right. Possibly the most severe of the short holes across the side of a right sloping hill to a similarly sloping green, surrounded by bunkers, some quite severe. This is probably the easiest of the short par four holes, and is viewed by stronger golfers who must wait for the two tier green to clear, as being a virtual par 3. This hole presents one of the most attractive views on the course. Standing on the tee at the top of the hill, the fairway Is set out before one, with the Half Way House and its friendly reception to await one. The 11th is widely regarded as one of the classic short par fours. The drive is over a severe bunker, with several more on the right, and with plenty of heather around it must be properly hit to give a chance of the hoped for birdie. This is the stroke 1 hole with the drive penalised either side and a difficult second shot to a higher green protected by a mound on the right and a heather and gorse bank on the left: A challenge for any golfer. This downhill par 3 is protected by a wide bunker at its front and grassy gullies around the back and sides. A fold in the green often complicates the putting. The longest hole on the course, the average golfer has to contend with an echelon of cross bunkers after threading his drive between a bunker on the right and rough on the left with barely 20 yards between. There is a hidden bunker to the green’s right. This hole is A long flat par 3 that many will require a driver to reach. A variety of tees on the left and right provide a variety of approaches for the handicap golfer. The green is bunkered on the left and short right, and a heather bank guards the right. This hole plays longer than its distance due its uphill second shot with long iron or wood, and many regards it as a par 5 due to the cross bunker short of the well bunkered green. The drive between bunkers must be straight to give a chance of a par. A downhill drive between a copse on the left and a hidden bunker on the right leave a second shot over a cross-bunker to a right sloping green. The drive falls away to the bunker on the right, which is a “par killer”. The second shot is over a cross-bunker to a green partly protected by bunkers provided by the Luftwaffe in 1940, which remained when it was found that they improved the hole.